The new animated film from the Disney/Pixar studio is certainly one of the most original movies I’ve seen in a long time. Rather than deal with sequels and remakes, “Inside Out” examines the emotional world of Riley, an 11-year old girl. As the title implies, the point of view of the movie is inside Riley, looking out at the world from a place called Headquarters, where her emotions live. Riley’s emotions are personified. Each of her four major emotions is its own animated character. Joy and Sadness, Riley’s dominant emotions, are female characters. Headquarters is also home to Fear (male), Disgust (female) and Anger (male). Early in the movie, Joy and Sadness become separated from Headquarters, and try to make their way back from Riley’s inner world. On their journey, Joy and Sadness meet Bing Bong, a one-time imaginary friend of Riley. Since Riley has outgrown imaginary friends, he wanders aimlessly through her unconscious mind. Still devoted to Riley, Bing Bong accompanies Joy and Sadness as they try to find their way back to Headquarters. Bing Bong comes through in a key moment, sacrificing himself for Riley. The inner life of Riley also contains “islands” where key concepts in Riley’s emotional life are stored. Among the islands are family, friends, and community. I wished there was an island for church or faith, but I guess that would be too much to expect in a mainstream American movie! On the outside, Riley has moved with her parents from her home in Minnesota to San Francisco. Most of us remember, at some stage, how traumatic moving can be. Riley has to adjust to a new home, a new school, try to make new friends, and play hockey, her favorite sport. Of course, she misses her friends back in Minnesota very much. All emotions are on high alert! With Fear, Disgust, and Anger in charge of her emotional life, Riley decides to run away from home and find her way back to Minnesota. Aware of this crisis, Joy and Sadness try frantically to return to Headquarters to save her! “Inside Out” delves deeply and cleverly into the psychological world of a child. Peter Docter and Ronnie del Carmen, who wrote and directed “Inside Out,” go where no film in recent memory has dared to go. For this they deserve great credit, and will likely be recognized during award season next year. They are astute enough to know that every emotion has a place. Of course, Joy wants to dominate Riley’s emotions every moment of her life. In the course of the film, Joy discovers that it’s not good for her to have total control. Of all the emotions, Docter and del Carmen recognize the need for Sadness in a child’s life. “Inside Out” lets its young audience know that it’s OK to feel sad sometimes. Every emotion is necessary for the healthy emotional development of a child. 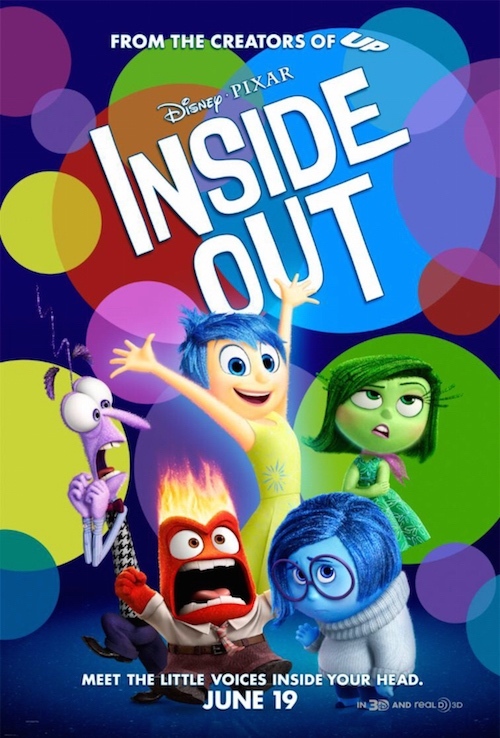 “Inside Out” is well worth seeing, if for no other reason than its sheer imagination and originality. Yet, I didn’t enjoy it as much as the greatest Pixar films (e.g. the “Toy Story” movies, “Finding Nemo,” “WALL-E” and “Ratatouille”). I didn’t find it as emotionally involving as these great animated films. At times, “Inside Out” seemed easier to admire for its originality than to love. I saw “Inside Out” at a crowded afternoon showing on the July 4th weekend. The theater was packed with young children and their parents. I wondered if young viewers would appreciate this movie, with all its abstract psychological concepts. Would all this be over the heads of small children? From the spontaneous applause at the end of the movie, I think “Inside Out” resonated with all its viewers. The film may also serve as a good vehicle to talk to children about emotions as well. I caution you not to leave before the closing credits. Some of the funniest moments of the film are at the end, exploring the emotional lives of the other characters in the movie, including cats and dogs.